If you have already visited Google’s home page today you would have seen another Google Doodle that is celebrating the birthday of Gideon Sundback, who was the Swedish/American electrical engineer who was most famous for the development of the fastening device that changed the clothing industry. To celebrate the man who invented the zipper, we thought we would share a couple of fitting zip games that are all zipper. First up for the owners of the iPhone, iPad, and iPod Touch is Zips that allows users to drag the zipper up and down to zip and unzip the pants. Users can even change their undergarment that is behind the zipper by simply tapping the settings button, and then selecting a new undergarment. There is also the option of adding your own pictures by tapping the camera icon. Zips can be found on the App Store for only Â£0.69/$0.99. iOS 2.2.1 or later required. 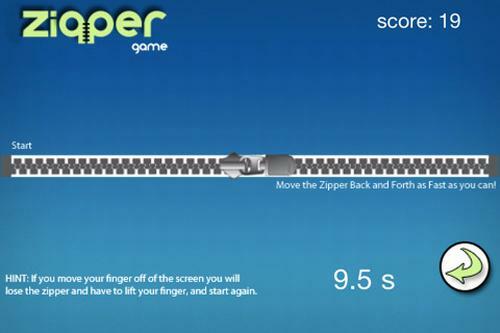 The next application we have for you has a bit more to it and is called simply Zipper Game, which has been inspired by the contest of how many zip and unzips can be achieved in thirty seconds. Users will have their chance at beating the world record which is 166 times in only thirty seconds. The standard format sees you zipping backwards and forwards as quickly as possible to keep the timer low, and the lower the timer the better score you get. You have to be careful though as going off the screen will see you lose hold of the zipper losing valuable time. With the advanced format the timer counts down while you try to keep getting points by going faster and the more points the better the score. Both formats have three skill levels easy, medium, and long with each of them have a different top ten score board. Zipper Game 1.0 is available free on the App Store and requires iOS 3.0 or later. It’s a simple game with a fun concept, which is a tried and tested formula for successful game apps for iPhone.